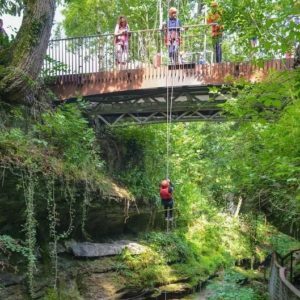 Home > Blog > Activities > What is Gorge Walking? An informative guide explaining what gorge walking is, where it can be done and who it is suitable for. This guide also explains gorge scrambling and ghyll scrambling. Gorge walking, Gorge scrambling and Ghyll scrambling are often used interchangeably to describe the activity of traversing gorges and the rivers at the bottom of them. Although there is subtle differences between the 3 they all involve climbing, swimming and at How Stean gorge, abseiling as well! The activity of gorge walking involves adventure, exploration, and discovery as you overcome challenging boulders and sweeping becks throughout the gorge. An exploration through beautiful and natural rock formations, and the discovery of the magnificent natural features within the gorge. To utilise the paths and challenges that the gorge has formed over thousands of years, trainers and visitors can take on the challenge together and ascend or descend through the ravine. As a gorge contains natural rock formations, chutes, and various challenges to overcome, we naturally want to conquer them. But how? The activity of gorge walking is a little more than the name suggests. Walking is certainly incorporated into the activity, but be prepared to have the time of your life whilst sliding, swimming, climbing, scrambling and stumbling your way up or down the gorge. No gorge is the same and each requires a mixed bag of methods to move up or down it. Although an exciting and challenging experience for all, gorge walking can be done by all abilities. Fitness fanatics, outdoor-lovers, and even the less active – no experience is needed as long as you are in the right place with the right instructors who possess the right expertise. Gorge scrambling is another term for gorge walking. Both walking and scrambling are involved in the activity and so the terms are often used interchangeably. There can be confusion surrounding ghyll scrambling. 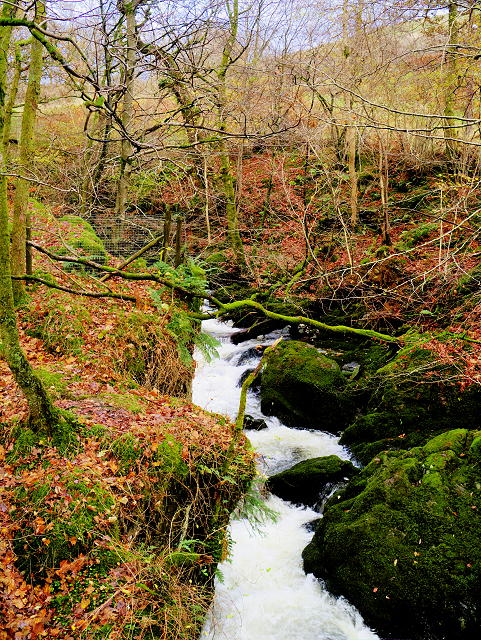 The word ‘ghyll’ or ‘gill’ means a deep ravine, especially a wooded one or a narrow mountain stream. If you are in this stream there is an opportunity to remove yourself from the water and walk along the banks, or scramble out of the ghyll. As a gorge has vertical sides you can only go up or down steam. Both involve climbing up & over rocks in flowing water with jumps into pools. Here at How Stean, we Gorge Scramble. For those new to the world of gorge walking, a gorge is a deep cleft between cliffs. Gorges are often formed as a result of erosion from a flowing river or stream over many, many years. The gradual erosion of rock eventually results in a deep void with towering sides. These steep sides usually frame a river, and although not present in all gorges, a flowing river means more adventure. Picture this – an exhilarating abseil as you descend into the beautiful gorge. Surrounded by tall limestone rock and with your knowledgeable and friendly guide at hand, you’re led through the challenging beck. Whether you’re with family, friends, or colleagues, you work together as a group to plunge into rock pools, slide down slippery rock slopes, scramble over boulders, and swim through the beck. The only way to travel through upper How Stean Gorge is to venture through the water by swimming, scrambling, and sliding. This makes for an extremely fun activity that is both challenging and exciting! 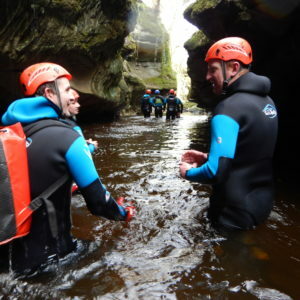 We also offer canyoning, which involves descending a gorge using advanced abseil and rope techniques.